For many being the neighbour with the best lawn is a badge of honour that always seems to be an elusive goal that can never be reached. We all know somebody on our street that seems to have all of the answers when it comes to cutting the grass and they normally aren’t willing to part with their secrets readily. Sure you could do a little covert spying on your neighbour with the perfect lawn, but you don’t have to. The secret to a great lawn is cutting your grass properly and that involves a few simple tips and tricks that anyone can learn. In this article we’re going to go over these in detail and if you follow these tips there’s no reason why you can’t be that neighbour with the perfect lawn that everybody envies. There are many different mowers out there and learning how to cut your grass properly starts by making sure you have the right tool for the job. There isn’t much point in having a riding lawnmower if you have a small little lawn that measures 12 feet by 12 feet. In fact, you’ll probably end up doing more harm than good if you try and use such a large and powerful mower on such a small lawn. In this instance it’s better to choose a small push mower with a modest sized cutting deck that will allow you to maneuver around your relatively small lawn without much bother. Think of your mower as a precision instrument that you want to be able to move to the flow of your lawn without causing any damage around the edges. Whatever you do in life you’re only as good as the tools you use and if you aren’t using the right tool for the job you’ll never get it right. Even if you’re using the right mower for the job you still have to properly maintain it. Every year you should go over every bit of your mower to ensure it’s in tip top shape for the season. There’s a lot more maintenance involved in taking care of a gasoline powered mower so if you’re not comfortable with doing the maintenance yourself you may want to take it to a local shop that specializes in small engine maintenance. They’ll want to check out the sparkplugs and check for any leaks that might cause you problems. Just last year I was heading out the driveway when I noticed the neighbour having a great deal of trouble with their mower. It had spit out unusual amounts of oil all over their pristine lawn doing untold damage. Apparently they’d been using a lawn care service, but decided they would save some money and take care of the lawn themselves. Unfortunately they didn’t think to check over their mower that had been sitting in the garage untouched for the past two years before using it. That was a major oversight on their part. No one wants to be scalped and neither does your lawn. My brother-in-law is not a fan of cutting his lawn so he always cuts it as short as possible no matter how much I try to convince him of the folly of his ways. Unfortunately the end result is one of the worst looking lawns you’ll ever see. His grass is extremely unhealthy and whenever we experience a hot dry spell in our area it’s a major fire hazard as well. You don’t want to follow in my brother-in-law’s footsteps. Don’t scalp your lawn. You should always keep it at a healthy length as grass that is a little bit longer provides shade for the soil beneath allowing it to hold onto its nutrients and moisture so that it can feed your lawn. In effect what you’re doing when you scalp your lawn is starving it to death. One of the worst things you can do to your lawn is to cut it with a dull blade. When you do this each blade of grass is ripped rather than cut creating a jagged edge instead of a clean cut. Cutting a lawn with a dull lawn mower blade can lead to all sorts of problems that you really would rather avoid. Your grass can become discolored and more vulnerable to disease. 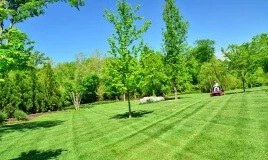 The other problem with cutting a lawn with a dull lawn mower blade is that you can end up with an unpredictable cut – some areas of your lawn may be different lengths and it can be a bit unruly looking. If you want a healthy lawn you should start by sharpening your blade before every lawn cutting season. The end result will be a nice clean evenly cut lawn that looks uniformed and proportioned. We’ve already talked about the importance of not scalping your lawn, but that doesn’t mean you shouldn’t set your mower to different heights depending on the season. In the spring there’s typically a lot more moisture in the form of precipitation and you may want to cut your grass a little shorter. 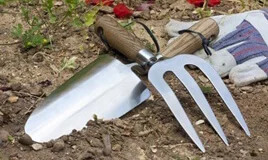 In the middle of the hot summer it’s best to raise that height up a bit to give the soil underneath your lawn some shade from the unforgiving heat of the sun. This will allow it to maintain its nutrients and to continue to feed your lawn with what it needs to stay healthy. It’s amazing how such a simple little trick like adjusting the height of your mower depending on the season is one of the most overlooked aspects of good lawn care. We’re not suggesting that this tactic alone is the key to a prosperous lawn, but it’s certainly an important one. In our busy lives we often try to fit the home chores in whenever possible. Perhaps every Wednesday evening is the only time you’re able to set aside for cutting the lawn and you’ve made it your duty no matter what to make sure you do. While this type of determination may be admirable it may not be the best approach. The weather isn’t always going to cooperate with your preferred cutting date. If you come home on a Wednesday evening and it’s been raining all day you should not attempt to cut your lawn even if the rain has completely stopped. That much continuous rain will likely leave your lawn a little waterlogged and stepping on it can do a great deal of damage – let alone running a heavy lawn mower across it. Unless you like the idea of nice big ruts and divots in your lawn it’s best to wait until the next day once it’s had a chance to dry out. This may not be the most convenient time for your schedule, but sometimes we have to make sacrifices if we want that perfect lawn. The best time to cut your grass is when it’s nice and dry. When your grass is dry it’s more likely the ground beneath it will be as well and less of a chance you’ll do damage to the landscape with your heavy lawn mower. When we say dry here we’re talking about dry and healthy. If you’re region is in the middle of a drought and your grass is dry and brittle it’s not the best time to cut it. You need to water it first and get it back to a healthy green color before you attempt to cut it or you can damage your lawn. This is difficult if there are water bans in the area so you’ll need to check with the local authorities to find out if it’s okay to water your lawn without being fined. Human beings are at their best when they’re allowed to go about their business in a moderate and comfortable environment. If it’s too hot or too cold out we have a difficult time concentrating on the task at hand. The same is true for plants. If you cut your grass in the middle of a hot summer day you’re putting a lot of undue stress on your lawn and it probably won’t respond well. The best time to cut your grass is when there’s a bit of shade in the early evening or early in the morning before the sun’s at its hottest (although your neighbours probably won’t be happy about the noise). The cutting process is stressful enough on your lawn and doing it in the relentless heat of midday is simply a double edged sword. The easiest lawn to cut is one that’s laid out in a nice square and if this describes your lawn congratulations! You’ve got it relatively easy. If on the other hand you’re like me and you’ve got a few obstacles in the way it can be a bit more of a challenge. The key piece of advice I can offer anyone with this type of lawn is to take their time and do it properly. I know this may sound like relatively straightforward advice, but you’d probably be surprised by the number of people that don’t follow it. If you rush around cutting a lawn with little gardens and extra curbs in your way there’s a good chance you’re going to miss the odd spot and end up with a patchy looking lawn. The reason you added those gardens in the first place was to make your lawn look nicer – you don’t want to ruin it by rushing the job. There’s been a great debate raging in lawn care circles for as long as people have had lawns to tend to and that revolves around what to do with your grass clippings. Most people either use a bag attached to their mower to collect them or they rake them up. There’s a belief that those clippings on your lawn will somehow damage it, but that’s simply not the case. In fact, grass clippings can act as a natural fertilizer for your lawn reducing the amount of bagged fertilizer you have to use and can help you grow a healthier lawn. In hot dry conditions we would still recommend bagging or raking your clippings. While we may advocate for using grass clippings as a great natural fertilizer for your lawn there are circumstances when this isn’t recommend. We’ve already mentioned the fact that it’s not a good idea to leave your clippings on your lawn in hot dry conditions as that dry layer of grass can burn your lawn. You should also collect your clippings if you’ve allowed your grass to grow a little too long. This might be the case if you’ve been away on vacation or if you’ve had an illness. If there’s too much freshly cut grass on top of your lawn it will be blocked from the life giving rays of the sun and this can do some serious damage. When I bought my first house my neighbour at the time was only too happy to provide me with some great lawn care advice and one of the first thing he told me was to always alternate your pattern every week. If you cut your lawn the same way all the time you can create ruts and compact the soil underneath creating an unhealthy lawn. Cutting a lawn with lots of hills can be a difficult prospect. You should always cut it from side to side and not up and down as it’s too easy to slip that way which can result in an uneven lawn. It’s also best to avoid cutting these areas of your lawn if there’s a lot of moisture present. Cutting grass on a slippery hill definitely increases the risk of injury. It’s best to wait until your lawn’s had a chance to dry off before you go back at it. If you thought cutting your lawn was a pretty straightforward process you may have changed your mind after reading this article. There is a real science to getting the most out of your lawn. If you follow the tips and tricks you’ve read in this article we’re confident you’ll be happy with your results. With any luck you’ll have the best lawn in the neighborhood in no time!